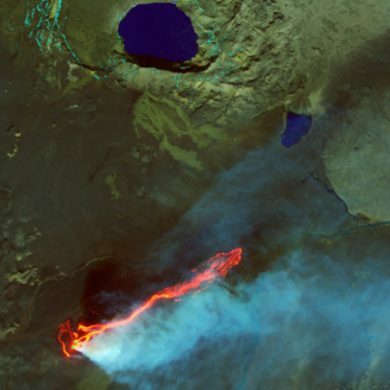 An Oxford University collaboration has found previously undetected health risks contained in the boomerang-like return of an Icelandic volcanic plume. The new study, published in Earth and Planetary Science Letters, traced the evolution of the plume chemistry from the 2014-2015 Icelandic Holuhraun lava field eruption and found an unreported secondary (older) plume that had significant impact on air quality. Operational health warnings in Iceland focused on the primary plume but did not include reference to the older secondary plume. Flying under the radar, this plume had matured and circled back to Icelandic cities and towns long after the initial alert had been lifted. Analysis of the secondary plume, which the team dubbed a ‘plumerang’, showed that the time spent in the atmosphere had transformed its volcanic sulphur content from gas-based, to small particles. This conversion meant that the sulphur dioxide (SO2) levels of the ‘plumerang’ were significantly reduced, and technically within European Commission air quality standards. As a result, no health advisory messages were deemed necessary. The study findings revealed that although the sulphur dioxide levels of the ‘plumerang’ were technically acceptable, the particles were small enough to penetrate deep into the lungs. Sulphur in this small particle form remains the single largest environmental health risk in Europe. Exposure to it could potentially cause serious human health problems, and exacerbate long term conditions such as asthma. It is estimated that whether human-made or from natural sources, short and long-term exposure to such particles, causes over three million premature deaths per year, worldwide. During the six-month long eruption, the Icelandic Meteorological Office’s daily forecast of plume dispersion only accounted for the young plume. The mature secondary plume was not forecast as part of volcanic air pollution monitoring. Moving forward, the team will work in collaboration with the University of Iceland, to build on anecdotal evidence gathered and continue to research the possible health implications of the ‘plumerang’.